Device fitted with sockets connecting an electric circuit to an electric device when the plug is inserted into it. Hole intended to receive a plug’s pin and establish electric contact. Device connecting a circuit’s ground wire, which allows the current to be conducted to the ground connection in the event of a short circuit. End part of an electric wire equipped with pins that are inserted into the socket contacts of an outlet to establish contact. 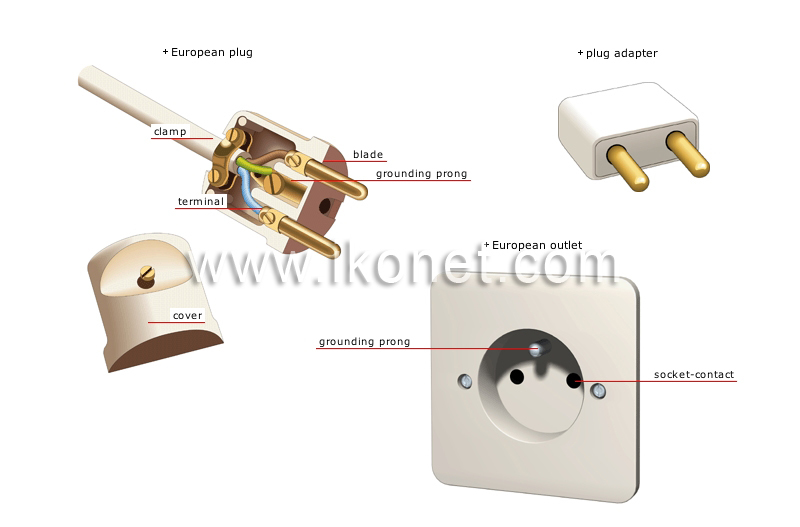 Part covering the internal components of a plug. Cylindrical metal part that establishes electric contact when inserted into the corresponding outlet. Metal part used for fastening a device’s wire to the plug. Part to which an electric wire’s conductors are attached.